Foundation can be a pretty unexciting bit of make-up. There are no gorgeous palettes, no hyped-up new season shades – and there are definitely no sparkles. But as the product that covers the largest area, along with its status as the first and most important step of your make-up routine, foundation isn’t a product to be taken lightly. Ironically, foundation is probably the product with the most exciting innovation. With so many different skin types, textures and tones to cater for, cosmetic brands have had to keep up the needs of beauty buyers, resulting in a pretty incomprehensible array of choice. Creating a flawless base is in theory easier than ever… it’s choosing the product that’s the hard part! 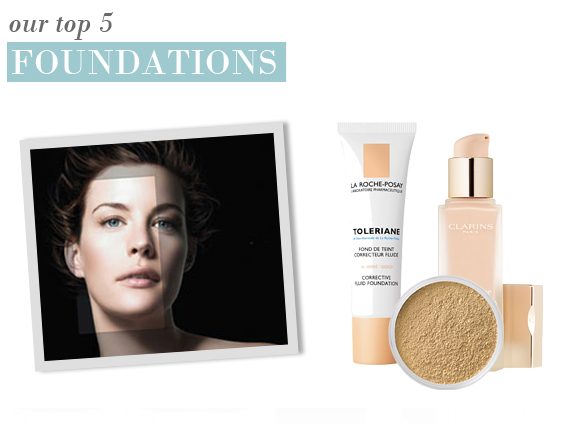 Take a look at our definitive guide to the best foundations, and see if you agree..
Like your skin – only more luminous! The formulation’s lightweight and silky texture smooths onto skin easily and lasts upwards of 15 hours. The coverage is great and the foundation doesn’t feel heavy in the slightest – it enhances the skin’s natural tone rather than masks it, and imparts a subtle radiance that makes skin look truly beautiful. A fantastic choice for dry skinned complexion enhancement. Innovations in cosmetics now mean that there has been an influx of products that are part skincare, part make-up. The best examples of this are in the anti-aging sector, where formulations such as Radically No Surgetics from Givenchy target wrinkles, sallowness and hyperpigmentation whilst providing a beautiful, all-over colour. When you have a chronically uneven skin tone, scarring, a skin condition or pigmentation, finding a foundation with enough coverage can be a truly transformative thing. One such formulation is the Dermablend Corrective Foundation, with a 25% concentration of pigments and a 12 hour hold that resists perspiration, rubbing and bathing. An essential product for those with skin imperfections. Choosing a foundation for oilier skin can be a nightmare. Newer products have come leaps and bounds in the omitting of excess oils from formulations, such as the innovative Matte Foundation. Matte goes further than most in that it also takes preservatives, talc, fragrance and waxes out of the equation, to deliver a flawless base with a weightless feel – a holy grail for oilier skin! Cool, soothe and protect sensitive skin that is prone to irritation with an oil-free, fragrance-free and preservative-free formulation especially formulated for intolerant skin. The fine fluid texture is enriched with ultra-soothing La Roche-Posay Thermal Spring Water, making it feel as light as a feather. A comfortable foundation for even the most irritable of skins. I've spent years trying to find a foundation to do what I need. Powders just highlight lines and wrinkles I didn't know I had and go patchy. Creams just seem to sink in and disappear and not give the coverage I need. I have pigmentation scaring on my jaw line and neck from hormonal acne as well as the usual uneven skin tone that comes with age. This product covers everything but its not mask like, it just looks very natural. It lasts all day, I no longer have to use a concealer or powder. A little goes a long way, I use a small pea size and its adequate for face and neck. This entry was posted on Friday, October 22nd, 2010 at 8:21 am and is filed under Hints & Tips, Make-up. You can follow any responses to this entry through the RSS 2.0 feed. You can skip to the end and leave a response. Pinging is currently not allowed.